While in Juneau, we took a bus tour to Mendenhall Glacier. It was the first glacier that I saw on our Alaska tour, and it was quite impressive. 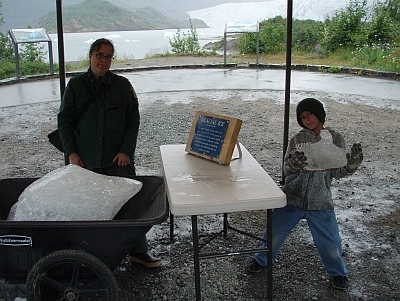 Pieces of the glacier had fallen off into Mendenhall Lake and Nicholas found one that had drifted ashore. At first, I told Nicholas that he needed to leave the chunk of ice right there. 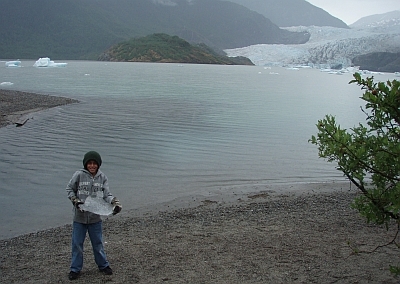 But then we found that the park rangers had taken another chunk of ice from the lake and were displaying it near the visitors center. So Nicholas wanted to bring them his own chunk of ice. 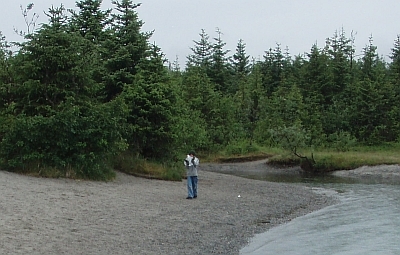 The park rangers were grateful and displayed his chunk of ice next to theirs. Their chunk was bigger, but they had special help.